Please note all personalized orders take up to 14 business days to ship. Each Nambé design captures the essence of timeless artistry and elegant simplicity that fits with any style. Whether for a wedding, a corporate gift, or just a job well done, Nambé lends itself beautifully to customization and is destined to become an office treasure or a family heirloom. Many of our Nambé alloy and crystal items can be personalized when you place your order by contacting us directly in New Mexico, where our fully equipped customization department is available to assist you in personalizing your Nambé awards and gifts. 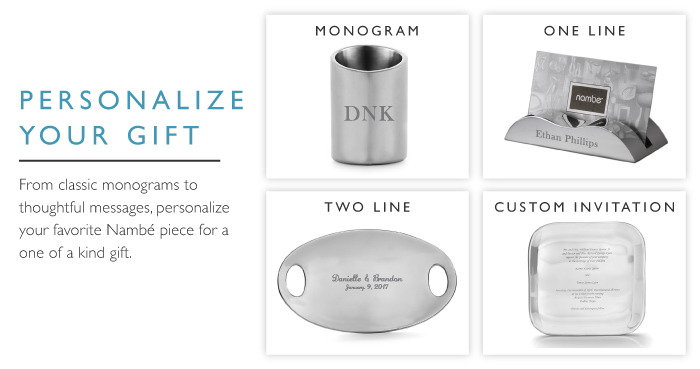 Personalization is the process of adding your own words or designs to your Nambé purchase, such as a monogram, a date, or a brief message that makes your gift absolutely memorable. Most Nambé alloy and crystal items can be personalized. Our crystal items are personalized through a process called laser etching, which produces a result very similar to sandblasting. We create a high-resolution image of your message and turn it over to our personalization experts, who use a computerized laser to create your message onto the surface of your Nambé purchase. For our Nambé Alloy products, the laser-etch process is followed by sandblasting for impressively sharp edges. Orders for items you wish to have personalized may be placed one of two ways. First, if the item offers online engraving, simply fill out the form on the product detail page and add to cart. You will need to verify your message and choice of font. If you select this method, your item will immediately be sent to the engravers without an email proof. If you want a more custom design, such as inclusion of a logo, or engraving on an item that does not currently offer the online engraving option, you should contact our personalization experts directly via e-mail at personalization@nambe.com to make your purchase and begin the personalization process. Our office hours are 8 a.m. to 5 p.m. MST Monday through Friday (excluding holidays). We typically are able to respond within one business day. You may also reach us via telephone during office hours at 1-800-443-0339, extension 7120. We prefer that you send information via e-mail, but we also accept faxed requests at 1-505-474-3565. Company logos or other original artwork can be placed on Nambé alloy and crystal products. We require an EPS or AI file, as a vectored image, and it must be in black and white, no shades of gray. Send files via e-mail to our personalization experts at personalization@nambe.com. To receive a quote, please send details of your request to personalization@nambe.com. In addition, we offer a corporate discount to many organizations. Please contact us at corporate-accounts@nambe.com for the requirements of establishing a corporate account. Choose the font that best represents the message you're conveying. For a more elegant occasion, such as a wedding, you may want to choose Script MT Bold or Signet Roundhand. To personalize gifts for colleagues and business associates, you might instead choose something formal, such as Monotype Corsiva for a female business associate and Garamond for a male. For a baby gift, you might try CG Times. All personalization is permanent and can only be removed by having the items repolished by our skilled craftsmen. Once we receive your order, it may take up to five business days for us to create a proof of your request and submit it back to you for approval. Once we receive your approval we will begin the personalization process. It typically takes 14 business days for us to personalize and ship your order, depending on the amount of personalization requested and the number of items to be personalized. An additional charge of $50 to $100 will apply for rush orders. When you contact us, our personalization experts will offer a specific quote for your order. Rather than return the item, you may choose to have the personalization message redone. The 20% repolishing fee will apply, as will all applicable personalization fees. Please allow up to six weeks for the repolishing and personalization process to be completed. We are sorry, but we cannot accept returns of or process refunds for personalized Nambé crystal items. Can I personalize a piece of Nambé that I already own? Yes, we would be happy to help with this. Please contact us at personalization@nambe.com for details on how to send your item to us.